2016 marks DJ Mag's 25th anniversary, so naturally we've planned a few huge birthday blow-outs! 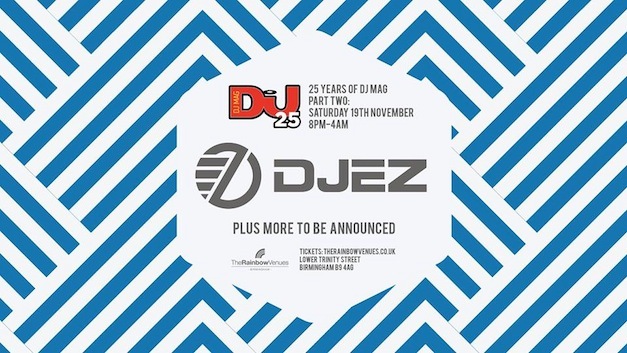 For Part Two of our 25 Years of DJ Mag party at The Rainbow Venues, Birmingham, veteran UK selector DJ EZ will be taking to the decks. The Londoner is a legend of the UK garage scene, but has become a something of a national treasure for his skills in behind the decks, and earlier this year even played a marathon 24-hour set to raise money for Cancer Research UK. Back in July, we were proud to present EZ as our DJ Mag cover star, and you can read the full interview with him online here. DJ EZ will be headlining our Birmingham birthday party on Saturday 19th November, sign up here to get access to tickets and line-up information before anyone else, and join the Facebook event too! And don't forget we’ll be heading to The Rainbow Venues on Saturday 8th October for 25 Years of DJ Mag Part One, with Hot Creations and Paradise head honcho, Jamie Jones, NYC super-duo, The Martinez Brothers, Chris Liebing, Clive Henry b2b Alex Arnout, Lewis Oxley, Lopaski and Bunny... don't say we never treat you!